Driving a Ford Thunderbird on a summer night takes you back to a simpler era. The V8 engine burbles as you cruise comfortably back in time. With two seats, a convertible top, and rear-wheel drive, it sometime feels like driving a vintage car, only it’s brand new. The Thunderbird combines design features from early Thunderbirds, including the original 1955-57 two-seater and the 1961-63 Rocket Bird. A V8 badge has been added to the front fenders of 2004 models to further the retro theme. Thunderbird’s 6.9-cubic-foot trunk is big enough to carry two golf bags. Driving the new Thunderbird is an exercise in being seen. It’s a beautiful car that attracts attention wherever it goes. But how it goes is just as important, and it does pretty well in this category. There’s plenty of power to drive the rear wheels and the traction control ensures a steady grip during acceleration. It’s a small V8, only 3.9 liters, less than 240 cubic inches. In fact, it’s smaller than the standard V8 in 1955, but it produces more power and meets all the modern criteria for emissions and fuel economy. Just as importantly, the modern engine is smooth, mechanically quiet, and ready to go whenever you need passing power. 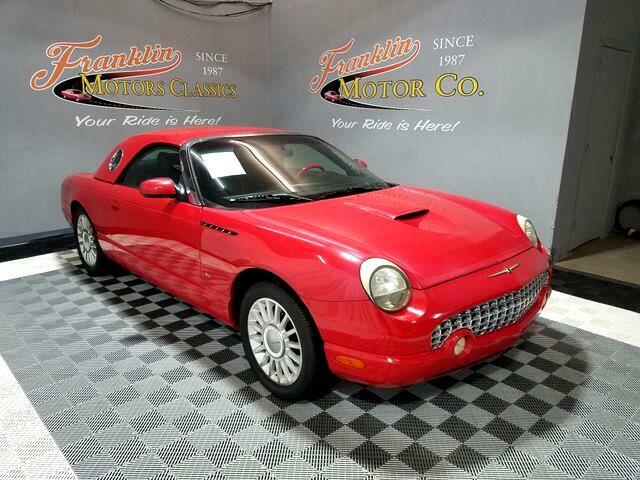 The Ford Thunderbird is eye candy, a beautifully detailed car in almost every respect. Cruising along in this car can be a joyous experience. Come and get it today!